Rare Book School received three major grants from The Andrew W. Mellon Foundation to fund a fellowship program at RBS, the Andrew W. Mellon Fellowship of Scholars in Critical Bibliography. The aim of the fellowship program was to reinvigorate bibliographical studies within the humanities by introducing doctoral candidates, postdoctoral fellows, and junior faculty to specialized skills, methods, and professional networks for conducting advanced research with material texts. The program admitted its final cohort of fellows in 2015. 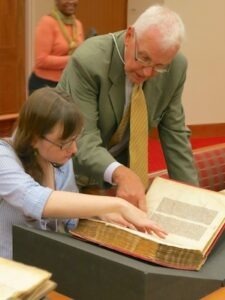 Courses at RBS, with travel and research stipends Mellon Fellows studied with Rare Book School’s distinguished international faculty once per year for three years. Fellows received hands-on, expert instruction by RBS faculty on interpreting the material forms of textual artifacts, from medieval manuscripts and early American hand-press books to born-digital materials. 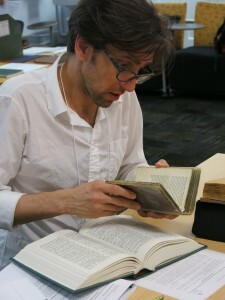 During these weeklong seminar-style courses, fellows had the opportunity to handle, analyze, and interpret materials from RBS’s c.80,000-item collection, from the University of Virginia’s Special Collections, and, in some cases, from the Library of Congress, the Morgan Library & Museum, and other major special collections in the United States. One course, Advanced Seminar in Critical Bibliography, was required; fellows chose the other two courses to suit their research interests. The fellowship provided a $6,000 stipend to cover travel, meals, lodging, course materials, and research-related needs, in addition to tuition waivers for three RBS courses. Seminars on critical bibliography During their three-day orientation to the program, fellows discussed bibliography and its place in humanities teaching and research in seminars led by prominent humanists and bibliographers. Fellows continued to consider the questions raised during these seminars as part of their critical bibliography course at RBS. The fellowship covered all expenses for the orientation at UVA. Symposia on critical bibliography Fellows were allocated $2,000 for use in hosting academic symposia at their home institutions. These symposia enabled fellows to invite distinguished scholars who are model practitioners of bibliography, book history, and related fields to enrich the ongoing critical conversations in their departments. Fellows hosted at least one event during their tenure in the program. Fellows who wished to organize a second event could request matching funds of up to $2,000 for this purpose. Bibliographical field schools Mellon Fellows attended three-day “bibliographical field schools”— that is, targeted visits to metropolitan areas (New York, Philadelphia, Boston, Chicago, &c.). Field schools were tailored to fellows’ research interests, and provided fellows with opportunities to meet with leading curators, private collectors, antiquarian booksellers, and conservators. We encouraged fellows to conduct research related to their ongoing academic projects at these locations following the field schools. Participation in at least one field school was required; many fellows chose to attend multiple field schools. Collaborative research trips To foster a community of scholarship for critical bibliography, the fellowship provided $1,500 of additional funds to fellows who wished to organize joint research trips to collections other than the ones visited during the bibliographical field schools. These funds could be used toward domestic and international travel made in collaboration with other fellows in the program.